A modern window profile with very good technical performance and a diversity of individual solutions. The unquestionable advantage of the Aluplast ID 4000 is its competitive price. 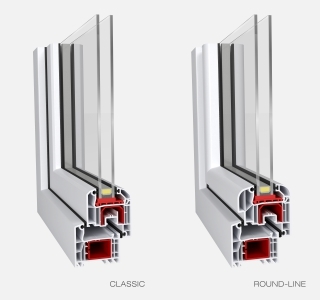 Window profile of classic shape and good technical performance offered at competitive price. Ideal 4000 is one of the most popular tilt and turn windows on the market. Thick profile walls and high-resistance EPDM rubber seals ensure great protection of interiors against heat loss and noise. Galvanized steel reinforcements guarantee stiffness and durability of the window shape. Easy water drainage is faciliated by 15 degrees steepness of the sash edge and frame. Smooth surface of the profile allows easy cleaning and maintenance of these tilt and turn windows. Increased glazed surface of the Ideal 4000 Round Line sash is considered as another advantage of this Aluplast tilt and turn window offering interiors more illumination. This has been achieved through the reduced height of the face of the profile by 5mm.